Spending quality time and energy studying and working hard is the best way to help ensure a good grade in science class. However, the old adage of "working smarter and not harder" is a time honored philosophy used by high-achieving students over the years; to this end there are some tips, tricks, and helpful hints being offered to provide science students with ideas of optimizing their learning. Some of these concepts may seem like common sense or mundane details. However, Leonardo Da Vinci, who was Einstein's idol and one of the greatest scientists/artists who has ever lived, was fond of saying that, "the details make the masterpiece!" Throughout the school year, try your best to incorporate some of the ideas being presented. Hopefully by the time you get to high school these concepts will be second nature for you. However, until one gets his or her PhD (doctorate degree), works on 25 projects simultaneously, and wins a couple Nobel Prizes, then staying organized is advised. Keeping one's backpack, 3-ring binder, notebook, study area at home, and other items organized lessens the amount one feels stressed and helps improve one's grade. And remember, stressed spelled backwards is desserts; so staying organized is a good thing and it tastes yummy. "Everything has a place, and every place should have its thing!" One's study area should be away from the television, video games, and other distractions. Some students believe that they learn better while listening to music, while talking on the phone, or while texting. Studies and investigations by medical scientists have shown that the human mind understands and remembers better when one is able to concentrate on the task at hand without distractions. Therefore, setting up a good study area is important. Also, one should plan on having a routined, set-time for studying. For instance, one could set aside the time of 5 pm until 7 pm each and every evening to study and do school work at one's study area. "Those who fail to plan are planning to fail!" Having a nutritious dinner, getting a good night's rest, and waking up to a healthy breakfast before taking a major exam is an idea that high-achieving students often practice. Professional athletes understand the importance of taking care of themselves for optimal performance. Education is the ultimate sport! Yep, that's right! Those pink erasers found on most yellow number two pencils do nothing but push the mistake to a different area. The best erasers to use are the white ones that professional artists, engineers, architects, and others in-the-know use. Since modern-day assessments often incorporate the use of "bubbling" in answers (e.g. Scan-Tron answer documents), being able to properly erase a wrong answer and bubble in the correct one is an important detail. If the grading machine sees two answers due to one answer being merely a smudge which was improperly erased, then the machine will mark the question wrong (even if one answer is correct). Having worked as part of a team at the nation's largest testing center and having conducted informal investigations into the matter, Mr. Mars can state without a doubt that a good eraser can make a difference in one's overall score on a standardized exam. Everybody learns differently. Some people are more independent learners, while others do better by learning in a group. Regardless of one's particular learning style, however, finding somebody who can be counted on for good information is helpful. Students should exchange contact information with at least one classmate. In the event that one is absent from class, contacting one or more trusted "study buddies" can help one stay up-to-date on what took place in class, homework, or changes to the schedule. Also, getting together somewhere, such as the local library, and conducting a study group is often helpful. 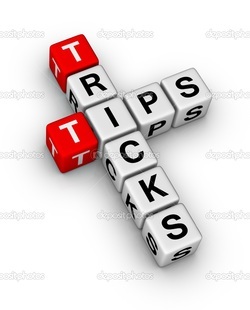 More tips, tricks, and helpful hints will be forthcoming, so check back often!